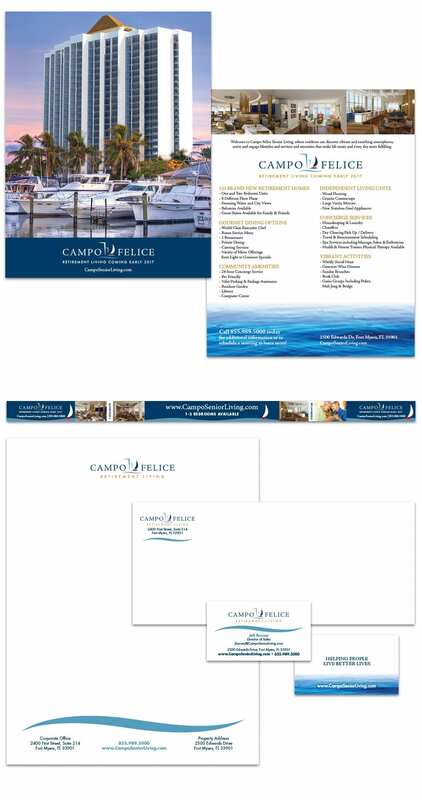 The MacFarlane Group contacted Spiro & Associates as their “go to” Agency when they began a new development project in 2015 called Campo Felice, a planned senior-living high-rise community. Company principal Robert MacFarlane is an established developer in Lee County, and has been recognized and credited for his contribution in jumpstarting the revitalization of downtown Fort Myers and working with city officials since 2001. This high-profile project is transforming a former hotel in the historic Fort Myers River District into a luxurious residential tower. We designed a logo and stationery suite to establish the project’s brand, then began a family of marketing elements including an amenities e-blast and visual design for the silt fence on the property while it is undergoing extensive renovations. Public relations activities are also underway giving the project “earned media” publicity, while more campaign components are in the pipeline.